Many times in mental health, professionals experience encounters with patients who perceive slights against them, when in reality, there are no real threats to fear. Whether due to an inability to properly comprehend reality or done intentionally to cause a problem, there are many documented cases of patients who file a regulatory claim against their mental or allied health care provider which does not hold water. That said, even a false malpractice claim can smear one’s professional reputation, cause a loss of trust in clients and staff, and cost a provider thousands in legal expenses to clear up. The good news is that if a provider carries the proper liability insurance coverage, they are likely protected, even if the claimant receives an ill-gained settlement for legal expenses. In reality, once a claim has been filed, the ability to control its course is out of your hands as a professional, and so, the advice offered here will center on preventing these claims from occurring, and how to secure proper protection for your practice. Documentation of intentions, as a privacy agreement/patient agreement, which can be prepared internally or written by an attorney, can help to avoid a patient who claims they are being charged for services which were not provided, or that they were not informed of costs, service limitations, and confidentiality requirements from the start. Keep on documenting! Every interaction with a client could prove to be important to the eventuality of a malpractice claim, should one be filed. Having accurate visit notes, including notations of any accusatory or suspicious behavior, payment compliance issues, failure to fill or take prescriptions, or threats can prove invaluable during the claim process. Manage patient expectations by remaining honest and upfront with clients about their situation without giving false promises when the professional isn’t sure they can fix the problem they’re facing. Know when to back off, because sometimes, a client is simply too sensitive to receive further constructive criticism. Perceived slight is enough to cause some problem clients to desire revenge by way of false accusation. Notify a client when there is a problem of any kind, and document the conversation in the patient’s visit notes. If it is necessary, report the patient using the local resources and alert emergency medical personnel if they display behaviors that concern the safety of himself or another person. Aside from these basic avoidance, little can be done if an irrational or irate client decides to file a false claim against a mental health professional.The best way to face a malpractice claim is to remain calm, never becoming aggressive or angry with the patient. Insurance is the best way to protect a mental health professional from a malpractice claim, and following these simple steps may help to prevent the problem from escalating may help to avoid the claim being filed in the first place. 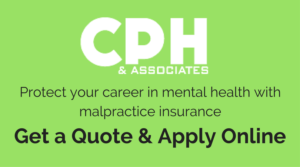 CPH & Associates offers guidance about the types of coverage needed by all mental and allied health professionals. You can get more information on the services they offer this industry here.